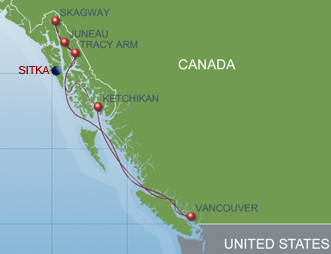 What does Sitka, Alaska and a 9-Night Alaskan Cruise have in common with the current Alaskan itineraries offerings for 2013? Nada, Zilch, Nothing at all... So why are they listed on Disney Cruise Line’s Site Map? UPDATE Feb 4, 2013: The Site Map has been “fixed” and no longer shows the 9-Night Itinerary or Sitka under the Alaska grouping. The links will change when you hover over them, but are not active. With just a few months before the Disney Wonder sails to Alaska I find it hard to believe DCL will change any of the 15 currently scheduled 7-Night Alaskan Cruises between May and September 2013. So what does this mean? 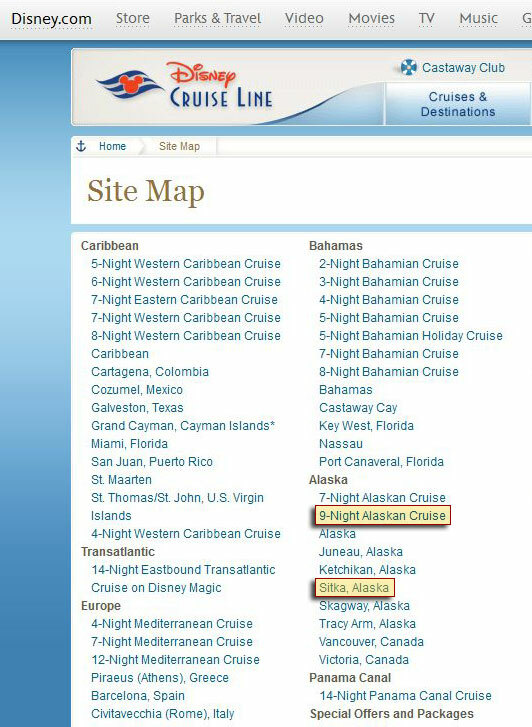 At first glance, I would pass this off as a typo if it were just a 9-Night Alaskan Cruise listed, but to also list Sitka, Alaska on the Site Map under Alaska is more than a typo. This latest finding, coupled with the previous business license issued by the State of Alaska lead me to believe the Wonder will in fact return to Alaska in 2014 with a 9-Night itinerary. This could be in addition to the current 7-Night Alaskan itinerary, or it could be replacing them. I’d bet it would be in addition to rather than a replacement. UPDATE: Confirmation? Not 100%, but more evidence. An article posted this past December on AlaskaPublic.org states that Disney Cruise Line has agreed to one visit to Sitka in 2014. More than likely, this will be part of the aforementioned 9-Night Alaskan Cruise and would come at the beginning or end of the cruise season in order to maintain a regular 7-Night port schedule. In addition to the two ships planning to use Old Sitka in 2013, a Disney vessel has signed on for one visit in 2014. It will be the cruise line’s first visit to Sitka. Disney won’t ferry its passengers to shore, so without a dock, their ships wouldn’t visit at all. According to Ed Ronco’s article the cruise ship dock was built two years by a businessman without any buy in from the cruise lines. It seems like it was a situation out of Field of Dreams where… if we build it they will come. This year will be the first season with line making regular stops to the port. This one call in 2014 sounds more like a test to judge passenger response before moving forward in 2015. Have you visited Sitka, Alaska? I’ve heard it is bit on the touristy side and full of cruise ships. This entry was posted in Itineraries, News and tagged 2014, 7-Night, 9-Night, Alaska, Disney Wonder, Sitka by Scott Sanders. Bookmark the permalink. That is interesting. The other night when I was online for my booking (sailing on the 1st Alaskan cruise this year), my cruise briefly showed up as a 9-night, but changed back to a 7-night just before the booking window opened. The only references I’ve ever heard to “Sitka” were in movies. Sitka is the oldest brother in “Brother Bear,” so there’s a Disney connection on that one. The other one was a movie with Ryan Reynolds and Sandra Bullock called “The Proposal.” Sitka, Alaska is the town that Ryan Reynold’s character is from. What was the name of the 1980’s sitcom, where a young Doctor wanted to go to Medical School … the town of Sitka, AK paid for his schooling … and was required to work off his tuition by being the town Doctor? Sitka only gets a few cruise ships a week and it is very usual to have more than one ship in port at a time. It has a decent downtown with local shops and numerous wildlife and historic tours. It still has the small town local Alaska feel that is missing in Juneau, Ketchikan and Skagway. Sitka, by far, is the best port on the cruise itinery, and those lines that don’t make it a stop are missing out on a great visit. Holland America is the only line of “larger” ships that calls there. Sitka is the Paris of the Pacific with Tlingit,Russian ,& American influnces the true gem of a city in southeast.Sitka shines brightly as one of the most beautiful natural destinations in the world.A protected port and a city diversified by the arts and trades. As a major cruise line CEO stated a few years back at a Sitka Chamber meeting Sitka is the most beautiful city we ever havd ported in but if we don’t show our customers Sitka they will never know they missed it . (Have you visited Sitka, Alaska? I’ve heard it is bit on the touristy side and full of cruise ships.) I read this on your page above and would like to say that Sitka receives around 100,000 passengers per season compared to the Million passengers approximately in Skagway,Juneau, and Ketchikan so how could it be full of cruise ships and the stores and sites are all authentic home owned stores open year round . It is probably the least of the touristy towns on any Cruise ship route . It celebrates it’s authentic cultures and it’s hard working families who live and raise their families year round in a fine community.